I get a lot of compliments on this tree... However I removed the bananas, they looked very fake and cheesy. I also took the plant out of the pot and separated the stalks a bit so it was a little taller and looked more full. 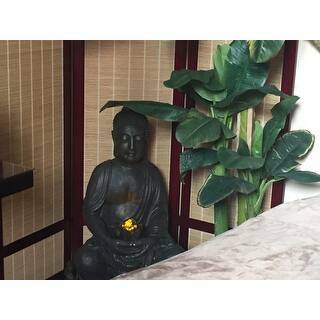 I bought this silk banana tree for my master bathroom which is a very large room with high ceilings. It is perfect and gives the room a tropical feel which is just what I was looking for. Finally got rid of that old ficus tree. The large leaves will be easy to wipe clean that's a plus. The bananas are so-so, the leaves are very nice & realistic looking even has brown spots. If you buy this tree, you will have to purchase another pot for decoration because it just comes with a small plain plastic container. I dressed it up with a tall planter (wanted the additional height) & river stones to cover the "dirt". It is absolutely stunning now with these additions. I gave it only four stars because of the cheap little pot it comes with. Compare the prices, you will buy from Overstock. Someone asked if the bananas were real! This is a very realistic tree. I love it! Upon getting you will need to unfold the branches. I looked at the photo of it online so I could bend and mold the branches to look like it does in the photo. I am very pleased with the triple stalk banana silk tree. It is very life like and it adds a perfect setting for my new dining room arrangement of bronze and glass. I have already recommended the tree to a friend. Thank you, Penflynn. 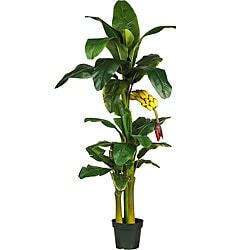 I was looking for a tropical silk plant or tree for our newly remodeled Florida room with a tropical theme. I was specifically looking for a banana tree and this one was just perfect! Everyone comments on it when they visit and the bunch of bananas on it are a big hit. The only thing is you will want to put it in a decorative pot or basket as the plastic one it comes in is not attractive. OK, the banana bunch doesn't quite look real, but the rest of the plant does--and it's a real conversation piece. I had to place it carefully though, since my cat assumed the hanging fruit was a toy for him to play with. I love my banana tree! It arrived on time and looked just like it did in the picture. I'm not a fan of "faux" plants, however I needed something for my tropical dinng room which gets very little sunlight. I am very impressed with the way it looks. It really adds to the room. I get compliments on it all the time. The price was reasonable as well. Thanks overstock for selling such a good product. Looking like a real banana tree! I normally would not use a fake plant in my home. But I had long wanted to have a real banana tree, which would make my living room feel like tropical place. However, a real banana tree would be very difficult to grow in a living room. I took the risk to buy a fake one from Overstock, after reading the positive comments on this website. And I am glad I made a right decision. Very realistic palm - little tricky opening and arranging the leaves but gorgeous once done. Leaves are a little stiff but the trick is to bend them in the middle and then curl them. Sturdy, colors true to picture. Palm needs a larger pot, I chose a ceramic one 13" high, 16" diameter, and it looks great. Love the clump of bananas too! Highly recommend this product. Good price and speedy delivery. The Triple Trunk Banana Tree was a "Stunner", and a much appreciated Gift! I love this bananna tree,It looks so real and tall,I put it on my deck,Lots of compliments on it,I'm getting another one,Price was very reasonable,fast shipping,Highly recommended !!!! Bought this for a gift and it looks amazing. Overstock sells very nice silk plants and trees. Looks really REAL. Al my friends thought it was a real tree. Great colors of the leaves and the banana. Great for indoors and outdoors. Perfect height. Very nice. You will need your own pot though as this one is very small. Leaves are easy to arrange. So so about the bananas. I think I might like it even better without them. Good size for a room with tall ceilings. 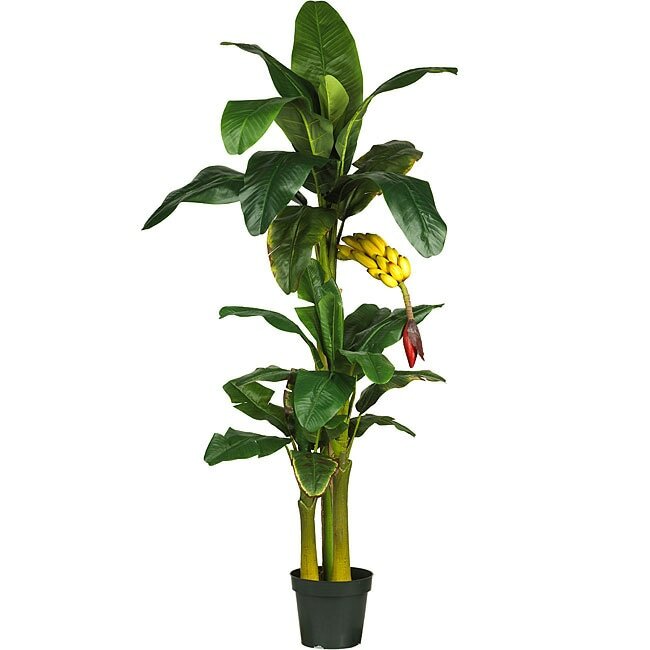 This silk banana tree has been one of my best purchases from overstock. people get amazed at how real it looks and almost touch the banana's to check if they are real. It definitely adds character to the room and the beauty of it. "Is this 6 feet with the leaves pointed all the way up?" This is 6 feet as seen in the picture. "can this be used outdoors?" A reviewer said it should not be used as an outdoor plant. I'm tired of the real one dying every winter!!!!!! "how does it come shipped? do i have to put it together?" Minor assembly is required. You would need to attach two pieces to the larger stem. Silk plants are great if you have a black thumb but love greenery. These artificial options are great alternatives to live plants. Adding plants to your living or working space is a great way to infuse your interiors with natural beauty, texture, and character.